Hello! My name is Kathryn, and I’m a graduate student in Dr. Mark Steele’s Fish Ecology Lab at California State University, Northridge. I am finishing up my first field season of my own research and starting my second year of grad school. 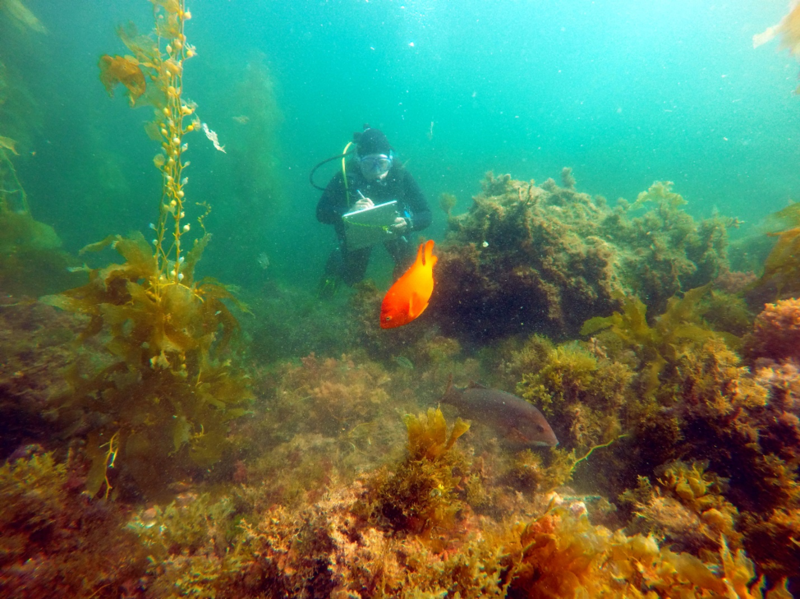 I am studying the effects the invasive alga, Sargassum horneri, is having on the trophic dynamics of rocky reefs at Catalina Island. I am specifically researching the potential indirect effects this alga is having on the local fishes. To do so, I am conducting what I think of as three stages of research. 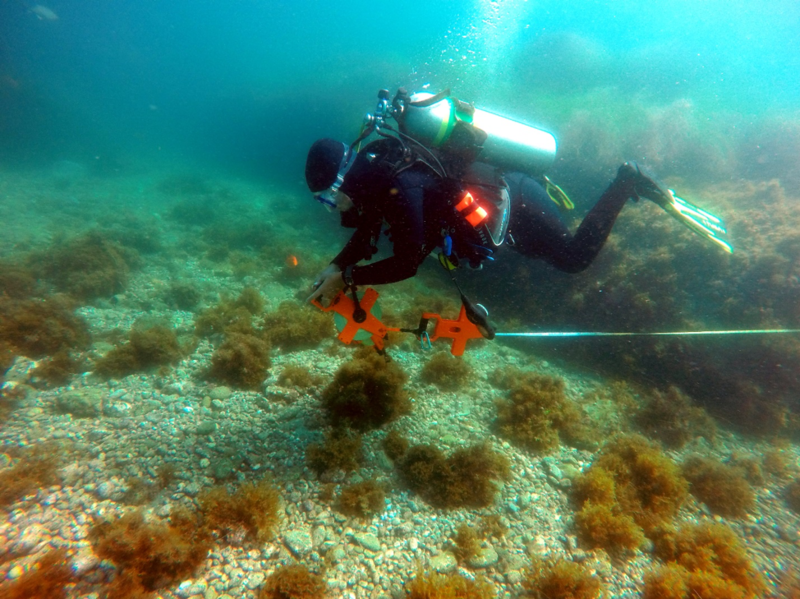 The first stage was fish foraging observations and benthic habitat characterization and algal coverage. 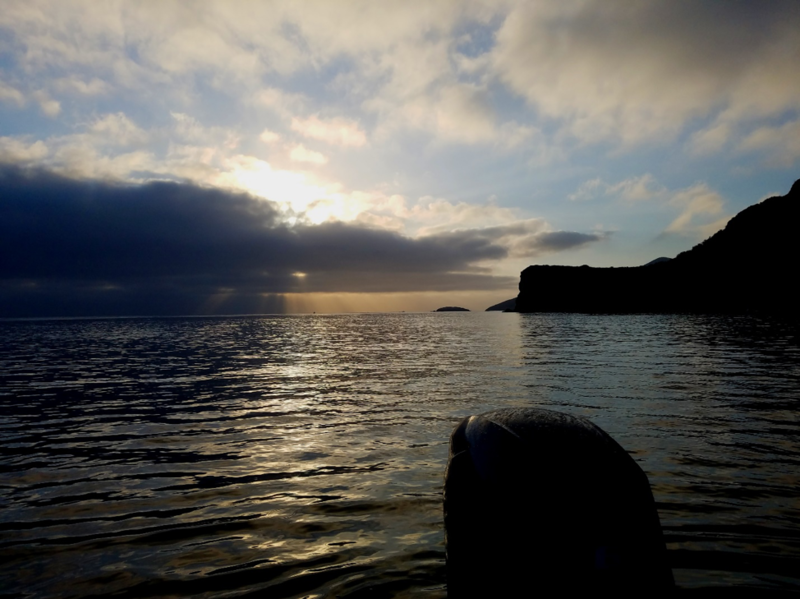 Over the summer, I observed three species of fishes, rock wrasse, garibaldi, and sheephead, at six sites along the leeward side of Catalina. Each of these observations were done via SCUBA, where I followed an individual taking note of their number of bites and what alga the bites were associated with. My benthic characterization involved running transects at each site and recording the habitat and algal species present. Coupling the foraging observations with the abundance of algae, I can see which algae fishes are preferring to forage among compared to how much is available. I am currently working on my second stage of research, where I am collecting rock wrasse at each site to assess their growth, reproductive output, and gut contents. To do so, I collect them using a specialized pole spear, called a microspear. I then process them in lab, extracting their otoliths (which can be read like the rings of a tree to age), their gonads, and their gut contents. I am using the gut contents to see what small epifauna that are living on the algae, are the targeted prey for rock wrasse. I will then use this information for stage three. Stage three involves collecting S. horneri so I can obtain the abundance of epifauna rock wrasse are eating living on the alga. I will then compare this to the abundance of epifauna on three of the native species of algae rock wrasse are frequently foraging among. 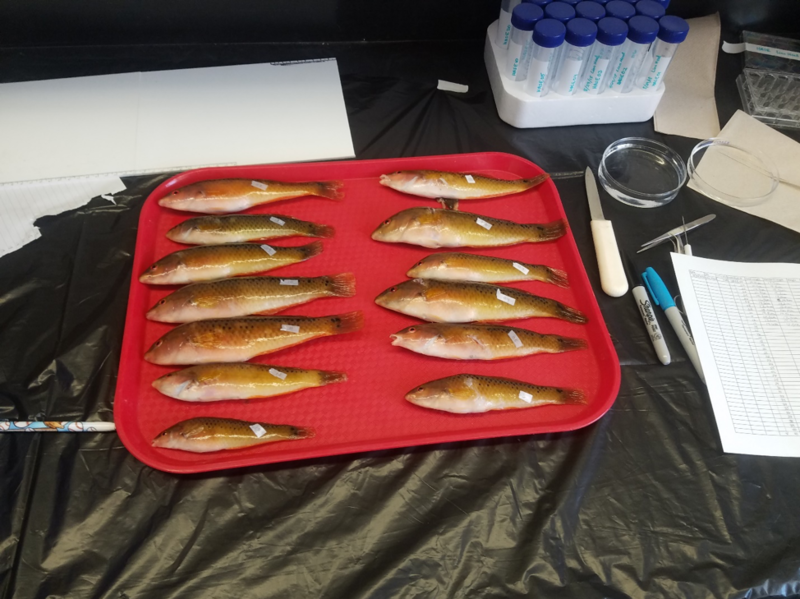 Lastly, I will extract the anti-herbivory phenolic compounds from the invasive and the native algae to see if there is a heightened concentration which can deter epifauna. So, what did all of this mean? I am essentially looking to see if S. horneri is providing a suitable habitat for epifauna, like the native algae, which alternatively provides a food source for fishes like rock wrasse, garibaldi, and sheephead. Given the rapid spread and growth of this invasive, it is important to assess the effects it is having on multiple trophic levels in order to assess the health of the reefs as the invasive persists. All in all, the Wrigley Summer Fellowship has provided me with the opportunity to research a question I am passionate about and eager to find out the answer to. I have been able to network with other graduate students and meet researchers from all walks of life. And I can never complain when I get to dive some of the most beautiful dive spots around the island every day. It has truly been an educational and inspiring summer! This entry was posted in Graduate, Wrigley Institute on September 19, 2018 by Jessica Dutton.